A French museum has returned the head of a 7th Century Hindu statue to Cambodia 130 years after it was taken. The statue, a representation of the Hindu gods Vishnu and Shiva, had its head taken in French colonial times. 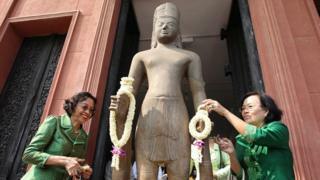 It was returned by the Guimet Museum in Paris at Cambodia's request and reattached to the body on Thursday. A Cambodian culture ministry spokesman said joining the head to the statue felt "like we are reconnecting the soul of our national heritage". "According to our Khmer culture, the reunion is symbolic of prosperity," Deputy Prime Minister Sok An said at a ceremony in Cambodia's National Museum. The complete statue had stood in the Phnom Da temple in southern Takeo province before its head was shipped to France in 1886. Cambodia has not ruled out allowing France to display the complete statue, known as Harihara, in the future. Over the past few years, Cambodia has sought to return artefacts taken by other countries without permission. In the past three years, several statues were sent back to Cambodia by US museums and a private collector in Norway.